In this episode of the While She Naps podcast I have a conversation Deborah Fisher and Stacey Trock about our favorite tools, books, websites, and other fun stuff we love that we think you might like, too. Deborah Fisher is the director and quilt designer for the Bright Hopes Collaborative Quilt Project, a non profit organization that gives those without a permanent home a sense of place, wherever they are, with a beautiful quilt that they make themselves or that has been made especially for them. She is the author of the just released book Sew Fun: 20 Projects for the Whole Family, a collection of dolls, stuffed animals, toys and quilts for adults to make for and with kids. You may remember I made the Hazel doll from Deborah’s book for my review. Deborah’s new project, Bo Twal, provides handmade cloth dolls to girls and boys in underdeveloped countries. You can find links to all of Deborah’s projects on her website and blog, fishmuseumandcircus.com. Stacey Trock is my frequent guest on the show. She designs crochet patterns for adorable and huggable stuffed animals. Her patterns are easy to follow and take the mystery out of crochet. 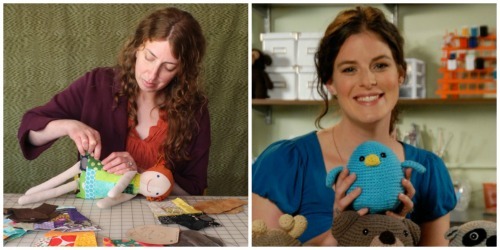 She is also a teacher on Craftsy, and nationally, and is the author of three books. You can find Stacey online at freshstitches.com. You can listen to the show by clicking the arrow below, or download it from iTunes for free and listen on the go. If you have something you’d like to say about this episode, or about the podcast in general, please leave a comment here. We’re always interested to hear from you! Thank you so much and enjoy the show.